In the summer of 2013 and 2014, Caleb spent 2 weeks working alongside the COO and CFO at one of Nigeria’s largest retail banks. He learned several vital lessons that he believed every individual wishing to undertake an internship, especially in Africa, should know. Planning ahead minimises time wasted during a work experience, internship or placement. It also makes you come across as confident, organised and respectable. Before my first internship in Nigeria, I emailed the COO of the bank a schedule of everything I would like to see and work on during my internship. He had previously worked at Citi Lagos, so I included a list of the divisions I had worked in at Citi London. I spend time creating a ‘bigger picture’ of the global economy and how the banking industry fits into it whilst at Citi. The COO was incredibly impressed with my proactivity and my extensive knowledge of the divisions and products of the firm. In response, on the first day of my internship, he went out of his way to invite me to the bank’s exclusive talent management graduation programme. In an environment where 99% of people have not met you before and you may be competing to win a full-time role, first impressions are often deal breakers. I visited the main branch of the bank in Victoria Island, Lagos and was told by the Senior Manager, that I looked focused, switched on and ready for business. He then explained to me the inner workings of the branch’s management structure, as he trusted me and knew that I would retain and make good use of the information. This shows that the desire to represent my mental standard in my attire actually yielded tangible results. I realised that good presentation when meeting employees or simply working during the day sends a signal that you take employee’s time, and your own time, seriously. This allows people to return the favour and take you seriously too. It is also critical to bounce back from negative comments about your attire with a positive attitude and evidence of a change. To my surprise, it was mentioned that I had forgotten to follow the dress code on my first Monday at the bank. Whilst this mention was casual and friendly, I was shocked. Since I was not aware of the dress code (a company tie and white shirt) as I had arrived the Tuesday of the previous week, I immediately asked for a company tie. As an intern, employees notice everything about you. Even small throwaways such as whether a top button is done up or a tie is the correct length. Positive and proactive responses to negative situations always display and reinforce a strong personal brand image. Networking is often encouraged, and rightly so. I believe that it is best done on a personal level, as this fosters a level of trust that causes individuals to genuinely look out for each other’s best interests. Whilst at the bank, I initiated a lot of conversations that turned into work experience opportunities. I constantly asked to see different divisions of the bank, and the people I met added profoundly to my internship experience. It is often the case, as a junior employee in a global institution, that the meaning of the work you’ve been given is forgotten. In fact, sometimes it is never communicated. This is a huge problem, and it is your responsibility to find out what exactly the purpose of your work is. Getting answers to the following questions will provide you with a strong framework for understanding your role and making a noticeable difference. What does this company do? What is its role in adding to the country’s economic revenue? Which sector or industry is it in? Who are its competitors? How well is it doing, and how can it do better? What does my division in the company do? How does this division drive the company forward and help it meet its goals? What problems does this division solve? And what issues currently exist in this division that I can be the solution to? Which team(s) or individual(s) am I working with in this division? What is their role and how do they add value to this division? How is my work adding value to the team(s) or individual(s) I am working with? What can I learn from the people around me about what to do more, and what to cut out? What new ideas and innovative solutions can I bring to my work and to the work of my colleagues? Also, scheduling meetings with managers, seniors, executives or board members help one’s understanding of large-scale problems that the institution solves, and also the large-scale problems that the institution faces. Success can essentially be boiled down to an individual having profound drive. Be outgoing. Be expressive. Think big, think positively, and think proactively. Don’t hold back, and take as many smart risks as possible. You never know where they will take you. 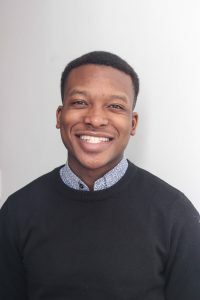 Caleb is in his final year of a BSc Management degree at the London School of Economics and Political Science and will be starting a career in investment banking at Barclays in the summer of 2017. He is passionate about mobilising an influential, creative and eclectic African diaspora network, and therefore loves being involved with everything that Movemeback does. Caleb loves playing the piano, especially gospel music, and is a huge theatre fan!